EXCLUSIVE Give your Valentine everything her heart desires. 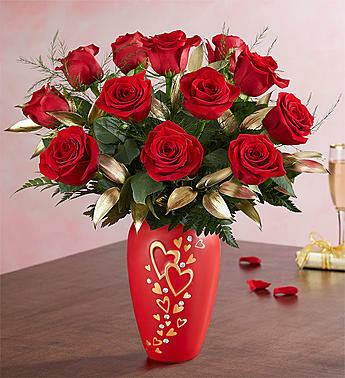 Start with a radiant bouquet of lush, red roses in our exquisite and exclusive Follow Your Heart vase, designed with beautiful gold hearts pattern. When it comes to wooing—and wowing—your special someone, listen to your heart; it knows the way!